New software updates, innovative apps, and smarter cellphones underscore just how quickly and constantly technology evolves. It can be hard to stay on the cutting edge with advances in today’s software, hardware and networks. With so many new ways for people and companies to use technology, there is a need for technical guidance and insight from information technology professionals. This page explores how IT degree programs can help students enter a job market as diverse and fast-growing as modern technology itself. Grant Kirby graduated from Oregon Institute of Technology with a computer science degree and later received an MBA from University of Oregon. He worked in the tech industry for 16 years as a network engineer, technical marketing engineer, and product marketing engineer. For the last 13 years, he has worked as the program director for Oregon Institute of Technology’s information systems program. In our modern technological climate, it is nearly impossible for companies to function effectively without information technology (IT) support for their computing needs. With a degree in information technology, students will be put in the position to achieve a career as an IT support specialist and utilize their technological understanding in problem-solving scenarios. We’ve looked into what each school offers in terms of student services, tuition, and student success rate, and we’ve compiled a list of the best programs available throughout the country. Check out the top ranking schools for information technology in 2017 below. 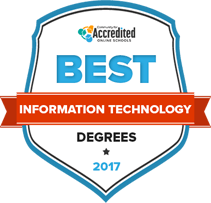 A degree in information technology goes beyond learning how hardware or software work, and teaches you how to apply technology to address specific needs. Information technology professionals create unique solutions with the technology at their disposal and effectively communicate these solutions to a range of people. Most importantly, IT is an ever-expanding industry with a variety of available jobs, leading to a bright outlook for graduates of programs. becoming more than a support/cost center, and it will evolve into a strategic arm of organizations. Because technology is now smart enough to mostly support itself, the focus in the foreseeable future will center on getting, understanding, and acting on massive amounts of relevant data. Higher education programs allow students to enter the broad and quickly growing IT field. An associate or bachelor’s degree can help students narrow down the type of information technology career they are interested in pursuing. These educational experiences can be applied to later graduate programs or to acquire IT certifications in specialized areas, such as the Cisco Certified Network Professional (CCNP), Project Management Professional (PMP) certification, or Microsoft Certified Solutions Expert (MCSE). Overview : Previous job experience or certifications in information technology may apply towards an associate degree, but students do not need any initial IT education to apply for associate degree programs. Many of the course credits for an associate degree can fulfill course requirements for students who plan to take their education further with a bachelor’s or graduate-level degree. Learning Outcomes : Students take classes designed to develop critical thinking skills as well as technical skills in coding, computer hardware and software, web design, cybersecurity, and data and network management. Students can also choose elective courses that explore more specialized knowledge areas. Colleges may ask students to purchase particular hardware and software to complete the technology coursework. Below are examples of classes that students typically register for and the skills that you would be expected to learn over the course of an associate degree education. An introductory course on designing, coding, running, and understanding computer programs, with an emphasis on troubleshooting business and engineering applications. Explores how to problem-solve via programming logic methods. Students learn and apply programming language constructs, including a project that translates real-life problems into forms that allow computer programs to solve those problems. By studying human interaction skills (e.g. leadership, motivation, group dynamics, stress and time management), students learn techniques for effective workplace interaction, including international workplaces. Learning Outcomes : A Bachelor of Science in information technology provides a strong foundation in information technology essentials like programming, systems administration, database and network management, security, and ethics. Students learn to program in at least one high-level programming language; evaluate operating systems and networks; and create, organize, and maintain modern databases. Courses also teach project management skills that help build students’ leadership abilities and establish effective tactics for on teams. At the bachelor’s level, students will typically specialize in a particular area of information technology, such as programming software applications, security, or network management. Undergraduate programs often require courses outside of information technology classes, such as humanities and science electives, that are part of a university’s general education requirements for all students. The following list presents information technology classes that students usually encounter when pursuing a bachelor’s degree. An examination of project manager techniques, such as efficient time use, accurate budgeting, and setting achievable project goals. Students acquire a foundational knowledge of current data communication and networking technologies, from the hardware to the components and connections of a network. Covers network protocols and the basic functions of network administration and operation. Covers structured query language, which is a standard tool for getting information from a database. Students use structured query language to store, retrieve, and manipulate data. A study of computer system security topics including cryptography, access control systems, telecommunications and network security, and disaster recovery programming. Overview : Ultimately, graduate programs teach students to understand business management functions, analyze and design integrated systems, confidently recommend IT strategies, demonstrate leadership and communication skills in project management positions, and conduct original research that contributes to knowledge in the information technology field. People applying for master’s programs must have a bachelor’s degree and experience with calculus, statistics, and high level computer skills. Students can specialize in different concentrations such as global business, pharmaceutical management, or analytics and information. Doctorate programs assume students have basic knowledge of calculus, statistics, computer science, probability, and linear algebra; a prior degree in computer science, information technology, or industrial engineering is advisable. Students seeking a PhD must defend an original dissertation and complete extensive independent research assignments, and some doctorate programs require students to teach an undergraduate seminar class or gain practical experience through internships. Graduate programs offer opportunities for customized degree concentrations and independent research, but there are basic course requirements that most graduate students will need to fulfill. Below are some of the classes students might choose to take for a master’s or doctorate in information technology. Students learn the processes behind organizing multimedia content, physical storage and retrieval of multimedia data, content-based search and retrieval, and creating and delivering networked and multimedia presentations. Covers the theoretical foundations, implementation problems, and research issues of electronic commerce. Students evaluate and recommend specific, current information technology processes in various areas, including network configuration, backup management, and system security. Students also examine network issues such as UNIX interoperability, addressing, and routing. Explores methods that will increase a company’s business value and capabilities. Students determine how they can improve the competitive advantage of an enterprise, evaluate management and market trends, and enhance customer service. How did you gain most of your IT knowledge?While so much knowledge can be gained through school, reading, seminars, and online tools, the real learning happens through controlled failures. Fail too much and you are out of a job. Fail too little and you become irrelevant. When looking into a degree program, consider how the courses explore various sides of the information technology industry. Will classes help students prepare for certification tests or give access to internships? Do professors hire research and teaching assistants? The more opportunities students have to use classroom knowledge in the real world, the more quickly they can discover a career path that excites them. A college’s information technology program needs to be accredited by the Accreditation Board for Engineering and Technology (ABET) to ensure that a program meets the standards of the IT profession. ABET maintains a list of accredited associate, bachelor’s and master’s degree programs on their website. Information technology is an active field, so look for professors involved in current research, classroom hardware and programs that are up to date, and courses that will give a strong overview of the basics. Both associate and bachelor’s degree programs should prepare students to take future certification tests through Cisco, Microsoft, or CompTIA, as these tests are a standardized way of demonstrating IT knowledge. Many working professionals choose to take higher education classes to advance their careers, and students may explore the IT job market with internships or contract work to see what areas interest them the most. Finding an on-campus program with flexible scheduling option can allow students to balance work responsibilities with school. Verbal and written communication skills and the ability to manage people are essential qualities in the information technology field. Information technology professionals may be in charge of planning a project and directing a group of people on implementing it, describing over the phone how to troubleshoot a faulty printer, or preparing manuals for employees or customers. Learning these skills should be integrated into an IT degree program. All IT degree programs expect applicants to have basic computer skills before applying. Information technology students learn programming languages, network and device troubleshooting, and other specialized technical skills depending on the level of higher education they pursue and the certifications they take. Troubleshooting is an essential part of IT work. Information technology professionals can weigh different technology options and choose the best fit, usually based on their experience with or knowledge of a particular technology. Information technology professionals work with people at all levels of the business hierarchy. They must be able to express ideas clearly over the phone, in person, and in writing. They may also manage groups of people during a project, where it is essential to be professional, confident in their own abilities, and able to listen and collaborate effectively with others. Readings and classroom discussion are not a substitute for working directly on IT projects and learning from your own mistakes. Students who complete projects or complete internships will have an advantage when applying for jobs that are looking for practical knowledge and proven skills in an area of information technology. Many information technology jobs deal with specialized technical procedures or complex technology, and employers look for job applicants certified in these areas. IT workers can be certified as a technician in charge of maintaining computers, printers, and mobile devices; or a project management professional capable of directing a team. Becoming certified involves passing a skills exam through a credible certification firm such as CompTIA or Cisco, and it proves a candidate’s commitment to their area of the information technology field. Those pursuing doctorates in information technology will engage in personal research projects that help develop the field, but students at any level can benefit from investigating an area that interests them and keeping up with changes and improvements. Employers appreciate candidates who have certifications and specific, specialized knowledge that proves their dedication to information technology. essential to succeed in an information technology job?The primary skillset of information technology has to do with problem solving. Each new wave of technology results in unintended problems that cannot be solved with the technology that created them. If a person does not maintain a healthy curiosity and a drive to solve these increasingly complex problems, IT is not a friendly place for them. Also known as information technology managers, computer and information systems managers plan, coordinate, and direct computer-related activities within a business. They set the technology goals for a company and put together the systems needed to meet those goals. This may include installing and supporting network systems, maintaining web sites, modeling data communications hardware and software, and supervising support specialists. Computer and information systems managers have strong leadership skills and project management abilities in addition to their knowledge of helpful technical systems. Computer systems analysts connect the separate worlds of business and information technology in ways that are tailored to individual company needs. They examine a company’s existing technological systems and procedures in order to improve them, working within a budget or particular project guidelines. These professionals are troubleshooters and problem-solvers, but computer systems analysts are also collaborators; designing solutions for clients’ distinct needs requires teamwork and negotiation along with industry knowledge. Computer support specialists advise people and organizations on the use of computer hardware or software. They help troubleshoot tasks such as printing, e-mail, program installation, and word processing. They provide technical assistance over the phone, in person, or electronically. When computer support specialists assist information technology employees within a specific organization, they are called computer network support specialists. When they assist laypeople and non-IT users who are having computer problems, they are called computer user support specialists. While information technology professionals help connect people and businesses with useful, relevant technology, there are degree programs that can prepare students for other branches of the technology industry. systems, or computer and information research. from agricultural to nuclear energy.